Two of the case’s lawyers, Julia Olson and Philip Gregory, spoke to a group of Yale students, faculty and community members Saturday about their work on the lawsuit, Juliana v. U.S. The talk was part of a larger conference focused on modern world issues called “Onslaughts of the Poor: Corruption, Emissions, Violence,” hosted by the Global Justice Program from Friday through Sunday. 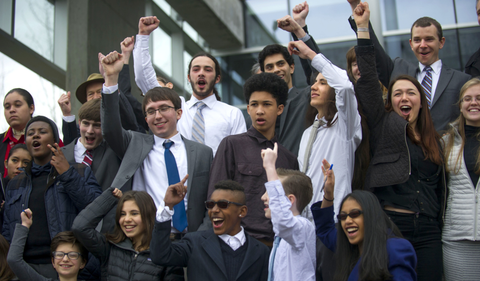 Olson, an environmental lawyer focused on conservation, and Gregory, a litigator who specializes in business and environmental law, represent Our Children’s Trust, an organization that fights for climate reform using legal action on behalf of young people. The plaintiffs in the case are seeking no money. What they want is a remedy to the current failure by the government to adequately address climate change. Saturday’s talk centered on the legal arguments brought by the children and their attorneys. Both speakers emphasized that their work is centered on the stories and the futures of the people they represent. He used the analogy of the government placing a foster child in a home it knows to be abusive. Any situation in which the government actively and knowingly endangers people is an infringement of their rights, he claimed. The lawsuit began in 2015 against the Obama administration and took a new turn when Trump took office. In June, a federal judge denied the White House’s motion to have the case dismissed. The Trump administration has since sought a writ of mandamus, a rarely used legal procedure in which a higher court orders a lower court to fulfill its legal duties properly. Many observers consider this move a desperate act by the Trump administration to prevent the case from seeing court. Olson explained that her case rests on a few arguments. The first invokes the Fifth Amendment, which states that no person may be denied their rights to life, liberty and property without due process. Olson and Gregory claim that by ignoring and perpetuating environmental problems, the federal government is in effect depriving its people of those rights. A second argument portrays the situation as systemic discrimination against young people. Olson explained that the government is discriminating against young people, who will suffer the most from the effects of climate change. Olson and Gregory’s last argument holds that through its actions, the government is creating a state-centered danger. The speakers clarified that they are not accusing the government of not doing enough to prevent climate change — it is not a failure-to-act case — but rather of actively contributing to the problem and disregarding established scientific facts for political reasons. They added that there is widespread support for the case, likening it to the Supreme Court case regarding gay marriage. Sayegh said he was optimistic about the case, calling the logic underlying Olson and Gregory’s arguments “bulletproof.” He added that the case has the potential to redefine the way the judiciary views climate policy. Some opponents of the case, including representatives of the Trump administration, have argued that a ruling in Olson and Gregory’s favor would represent an abuse of power by the judiciary. One attendee, Alex Sabbeth ’71, said he was unsure about the future of the lawsuit. The case is set to be heard on Feb. 5, 2018. Every person on the Planet should be in on this!